The Duet Tablet Arm Chair from Global has a sleek, versatile design that fits many applications. With a folding tablet arm attached to your chair, a comfortable writing surface is never more than a few seconds away. 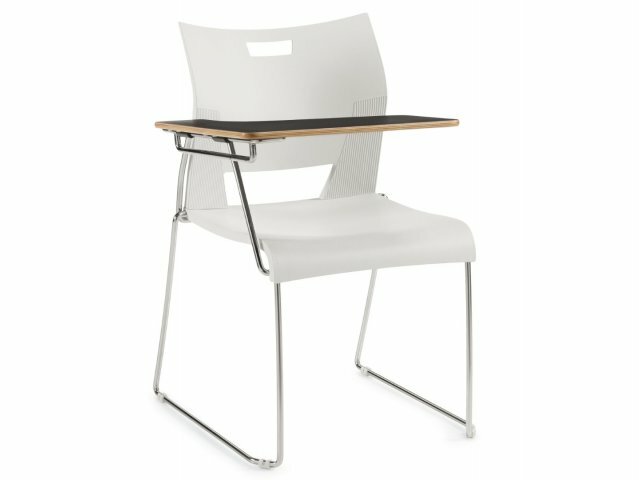 The sleek black shell and chrome frame have a professional appearance that makes this guest chair an appropriate option for schools and businesses alike. 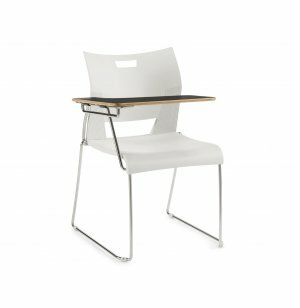 This tablet arm chair is designed to give your guests or students a comfortable fit. A large back and waterfall-edge seat facilitate healthy positioning. The tablet arm slides back and forth for easy entry and exit. With good looks and a functional design, this tablet arm chair will make an excellent addition to any classroom, lecture hall or training room. Smart Design: Tablet flips up and slides forward and backward for easy entry and exit and comfortable positioning. Smooth Surface: Tablet is constructed of 7 ply Birch veneer with a high-pressure laminate finish and lacquer coating on the edges. Convenient Carrying: Built-in handle in the back of the chair makes it easy to move. Comfortable: A waterfall seat reduces pressure at the back of the knees. Easy Cleaning: Polypropylene shells are easy to wipe down between uses. Sturdy Frame: The steel-rod, sled-base frame provides superior support to the seat.